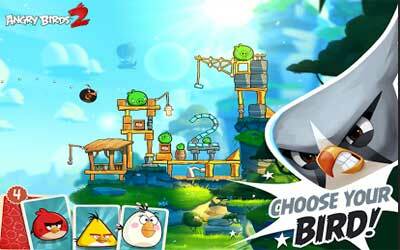 Previous version Angry Birds 2 2.14.0 apk for Android will help you to downgrade or install older app easily. This is one of the best Casual apps. Since the developer of this game managed to milk the franchise by making it into a lot of merchandise and many new titles, we have managed to find at least thirteen new titles made out of the original gameplay, whether it shares pretty much the same game mechanics or maybe it has different set of world and universe for the angry avian, the game continues to be an enjoyable game to pass the time. But as many as it is, but it’s actually pretty odd that we only manage to meet the Angry Birds 2, which shares many similarities to the original game on the surface level rather than filling its role as successor. Basically, the new game of this game begins with the premise of theft done to the egg by the big bad piggies. Well, there are a lot of improvements to this game in terms of visual, music, and the animation too. On the other hand, Rovio decided to give the game same gameplay mechanic as the original angry bird which all bout catapulting birds as bullets (that sounds off, I know, but you get the idea!). However, it does not end there as there are also new features included here and there to ensure that players of Angry Bird 2 for Android can improve their gaming experience. The best angry birds game so far. Love the graphics. The game is really fun and it keeps you interested. Glad to see angry birds is still around and growing. Keep up the good work.